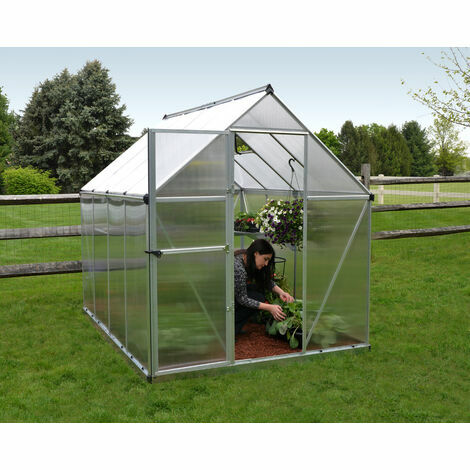 The Palram Mythos™ 6x8 is a clean lined Greenhouse. It helps you to maintain level temperatures and diffuse sunlight for sensitive plants. It features virtually unbreakable, twin-wall polycarbonate panels, and a heavy duty rust resistant aluminium frame. The Mythos offers a hinged lockable door with a magnetic catch, a roof vent, gutters, and a galvanised steel base for improved stability, alignment and additional height. The Mythos greenhouse is the elegant and practical, perfectly designed to fit smaller gardens and protect your plants from the elements so you can start growing earlier and continue growing later.